While Trains is a already confirmed feature and therefore inappropriate for posting in "suggestions" for this discussion I wish to talk about my feeling on the Realism/Balance/Entertainment factors. Realistic derailment would literally derail the fun out of trains. Calgary has a subway that transitions into a Lightrail system. If the rail network must be a realistic one track system I would recommend frequent siding to prevent blockages/crashes however I would recommend a two track system for reasons I hope to explain in detail later. There appears to be a large rail yard in Calgary, that can be used as inspiration for locations. While I can understand derailment as a deterrent for the reckless and I have an idea on how to have subdued derailment, I wish to warn against realistic and dramatic derailments. In short such dramatic crashes would be a real pain to fix and might even cause unnecessary psychics stress. Even if this was addressed by the train teleporting back onto the track after a few seconds you now, well have teleporting trains. On the opposite end you have the train NEVER derailing, practically encouraging players to drive at full speed at all times with the trains coming to a sudden stop when colliding with a buffer or another train. While this could cause damage to the train, it seems weird to me. I purpose "light" derailing even allowing train bandits if you so choose to put on derailers meant for safety concerns for nefarious means. this same type of derailment would also happen when exceeding speeds on the tighter turns, or crashes. This even allows the "model" to not stray from the cess (the edge of the ballast), now this next bit will come off as a bit "memey" but bear with my reasoning. I recommend that to get a derailed railcar/locomotive back onto the track to use a "train jack" and yes I am aware this is in the realm of turning nine diamonds into a block, but I belive this to ultimately be balanced, punishing reckless driving, allowing a derailed train to not simply run away in a few seconds, nor for it to take a few REAL hours to fix. You have to grab your tool, EXIT the locomotive, attach, crank (no more then 2 minuets say) and then detach an involved but not burdening process. More in time, do share you thoughts in the mean time. After a bit of research it turns out Calgary has one of North Americas most busiest Light Rail lines, this line also has some subways stations which I can see is already being developed. with the Line sometimes going overground it makes for an interesting line, It also appears to be fully electrified with a live "third rail" as well as an overhead line. Here is the newest model to finish. Part 3, to use One or Two tracks? I acknowledge North American railways, are often single track the problems start to come however when you start to get a bunch of disorganised train drivers down this line eventually there will be a purposeful or accidental blockage. In effect shutting down the entire network, while I accept there will be places where it would be hard to stop from happening it would be less likely on a double track line. Forgive the rudimentary nature of this illustration, in 1) We see the problems of a blocking train (red circle) on a single line, even with sidings, in 2) we can see the blockage can be avoided by simply switching onto a new line but in 3) we see the problem of a determined block on a switch. Trains are a feature I really look forward to, however questions like "but what happens if someone blocks the line" is something I hope can be answered before we get into (full) release. It should be interesting after all you don't really see functioning trains in a survival game so questions like this seem to have never needed to be answered. You can't just have a SINGLE train on the entire network as it lends itself to be hoarded by the "alpha tribe" (oldest most prepared group), I hope we can find an acceptable solution. Part 4, Noteworthy points of Rail interest. I certainly would be excited to venture or even base in a place like this, this in fact is about where I would Ideally want to base. And the Canada Pacific Railway limited HQ's. A stunning Local in its own right, and even has its own rail yard in the back. From above, as above there is no need for a true replica but "inspired" would be lovely. If I recall the majority of North American Lines are not electrified, this means diesel operated locomotives, and that may well mean fuel maintenance. If not done carefully I can see quite a few problems that can occur, as stated in the summery I saw a figure that states that an efficient locomotive will do three gallons to the mile with approximately a 3000 gallon tank. with refueling requiring an advanced logistics network and designated refueling points. So, how to keep a careful balance between Fun/Balance/Realism? I suspect in the player base it may well happen that a train could run out of fuel a fair way away from the designated refueling points, forcing refueling by truck or hand (nobody wants to spends hours refueling a locomotive by hand with nothing more then Jerrycans). I propose more "video gamey" mechanics, simply reduce both capacity and consumption to be more in line with cars/trucks. As can be seen below I see that Track tools are already available. While I will take it as a tech demo, I will still wish to discuss a few feeling I have on the above layout. Next to the nearest signals I see a inconsistent level of the track, a bump that size could cause derailment or an awkward lurch. Many of the turns are too tight, this matters because there would be a real danger of carriages jamming together, it would also cause the train to slow. It is important to note that track are as level and straight as possible to maximise speed. However I see that the road tools can do this with ease, I simply must warn that the rails need to have trains to be able to run on them not just look pretty. However while I have not see anymore examples I am confident a good line will be made. I recommend realistic Railways to better the smooth operation of the trains but practically everything else should be adjusted to be more manageable and user friendly. More when I am less tired. Calgary is situated in an oil rich region and contains a fair number of oil refineries and related facilities, I would think that on-hand oil product supplies would suffice for quite a while given the needs of a small post zombie apocalypse population. A typical Jerrycan can hold 5.3 US gallons, the tank in a locomotive is about 3000 Gallons, and its consumption is 3 by the mile. Are you telling me "on Hand" Diesel will not only suffice, but you are comfortable filling that tank over 600 trips? My recommendation was simply to balance your typical diesel locomotive to something far more manageable for a player to use. Fuel tanker trucks should be reasonably common both IRL and in game, and were the main method of refuelling locomotives at the rail yards I've worked at. While true, in a hypothetical scenarios where the locomotive is say stalled on a bridge or a highly difficult to reach area (with a fuel truck) you then come across a scenario that becomes problematic. We have to approach this as "worst case scenario" as while there will be responsible drivers it has been known since even before the time of the internet that there are people that get there kicks from making others suffer. Quite simply what practical steps can be made to ensure a locomotive can move from anywhere in a time that wont make most players give up, or completely clog the rail network. Once again I hope we can discuss the hard questions before we are tested. The train will continue to move (but slowly, foot speed perhapes) if it "runs out of fuel", Gamey but has its merits, notably allowing a train to stagger to a convenient point for refueling. You might be aware of this already, but there are motorized car pushers, which come in many forms and some are able to be driven on roads or are compact enough to be vehicle portable. There are also manual car pushers, if you have no shortage of time and strength. It hadn't occurred to me as really these are not really intended to fill the job of a locomotive, Not a solution I would personally go for but also a fairly valid one taking a few liberty's (like how the description on that "manual mover" states its only appropriate for ONE car on FLAT terrain and would do no help for a stalled train on a slopping bridge). Despite these realistic drawbacks if given balancing like my "train jack" we do have a nice foot speed way of moving a train. While that one by the Subway car is small my instincts tell me I would break my back hauling that thing off a railcard and onto the track without aid from a forklift. I otherwise can't comment too much on the rail mover itself as I could not find too much about there specs, however as viewed from the players stand point you would ask a player to (likely on foot) go to the nearest depot where they can find one of these rail movers then drive it up to the track and push the train ready for it to be refueled again. Realistically its possible, I don't think player trains would have many cars on them so a mover could even act as the locomotive for the smaller train. But would all these steps be FUN? I really am a fan of realism over balance but there is a point where realism can get tedious as is widely noted in the long time it takes to loot in RDR2 for instance. Well, if nothing else, given that there are no really long rail bridges, tunnels or other places that would be difficult to access by fuelling truck in the Calgary area, even a single jerry can probably power a locomotive enough of a distance to at least get it to a more convenient location. But through all this my stance remains the same, I don't expect or even want this to be a true railway simulator, I really do like the addition of the trains but I understand them to be a sideshow and therefore there development needs just the right amount of Realism/Balance/Fun. Regardless I think this conversation is turning fruitful, it is important to not to just talk about zombies and guns there is MORE that dead matter promises and why I'm even here. I am curious however if the Devs have any thoughts on trains yet? On another note these snowplows look awesome. also it should be noted the importance of railway reflectives are mostly ORANGE not the more common green so they are less likely to blend into trees as they work on the tracks. Train's wont derail, though to my knowledge nothing has been said on the need for fuel, or the lack thereof. That does honestly seem weird, But not deal breaking. I will take an assumption the plan is a train would "breakdown" if it collides with another train or buffer at speed. And I will encourage that at minimum, as driving a train at maximum speed and then jarringly coming to a sudden halt seems odd as is, for there to be zero repercussions (no damage to player or train (let alone derailment)) is bordering farce. But I really do appreciate you taking the time to get back to me and answering truthfully to all you can and honestly understand if you guys feel trains need pretty minimal attention compared to other elements of the game. I will take an assumption the plan is a train would "breakdown" if it collides with another train or buffer at speed. Essentially, yeah that's the plan. Colliding trains will cause a lot of damage that will require repairs, but won't derail because the physics for it would be really expensive. I have made suggestions for "minor" derailment (the object in question effectively "slides off"), But I am no programmer so I can't know how easy that would be. My remaining (and main) concern however is how you intend to stop (or alleviate) the rail network from clogging (all possible sources)? Not an easy answer I know. From what I get trains will be simpler then I had hoped, but decent enough for me to be satisfied. Good luck then hope to make in-depth reviews when the time comes. Realistically speaking, vehicle fuel of all kinds should be abundant in a game set in a major oil producing hub, where there are refineries, tank farms and railyards full of tanker cars everywhere. Unless regional fuel supplies were sucked dry at the dawn of the disaster, which is not a given, there should be far more available than a relative handful of survivors can reasonably use. That it, at least until it starts going stale. Has some truth, there are a LOT of company's related to the petroleum business in Calgary even some HQ's but from what I remember of the lore the world was already ending just before the game starts (news reports CEM (Canadian equivalent of FEMA) camps). I recall (but cant find) the Gas prices on the dead matter gas stations being very high, a sign of a gas crisis. Again for the record I am under opinion of recommending a lower then realistic fuel consumption for trains to bring them in line with being more equivalent to a fuel inefficient car/truck then a large freight train. I wish you all to consider that a train can not (really) leave its tracks, and realistically has a capacity that is far too large for the simpler needs of a typical survivor therefore you would be having a player running a say 1-3 car train (if not just the locomotive itself) but consuming far more fuel then if they simply used a van or even 18 wheeler (the trailers have unusual psychics but I see you already are working on this general area). Even if the lines are very direct what stops the player simply using the overall cheaper road vehicles. After all whats the point in adding something that's never used. Fuel for public use may have been rationed and/or subject to early distribution difficulties, although local stocks may well be greater than normal because of it. Me personally, I like trains and all, but I wouldn't find them particularly useful in-game unless they can be readily adapted into a full featured home base that has the advantage of being mobile. Must admit a "Landship" like base does sound cool, something I had not even considered. I simply hoped for mass hauling rail side salvage to a logistics warehouse by the railway that I would personally want to use as a base. That and historically there was a short but notable time when many nations especially Russia used armored trains as a tool of war in its own right. Modified rail cars allowing for firing holes could make for deadly mobile fortresses. (the limitations of rail however naturally limits its effectiveness). Note that I actually DO NOT recommend steam engines, there psychics and fuel consumption are much more complicated from a survival game standpoint and there would not likely be one operating around there anyway. This seems like another one of those things where the dev's implement a basic but functionally complete mechanic and then modders will expand it's functionality to suit their tastes. I expect a simple, cartoonish derailment mod pretty soon after the train update/ when modding functionality is added and I have no doubt that if this game gets the player base I believe it will, eventually you will be able to play train simulator in it for those who want rail transport to be a real slog. Certainly, But it would still be important to discuss that "base" and what it would be like. The layout itself seems realistic nice long smooth lines and steady turns. They have gone for the realistic one track layout. His stated example is that the current railway seen above is no where near the water at present (unlike the real counterpart). He said it was to conform the games idea of, a lightly based on Calgary area using no real world information. He did say that the track tools where made by another Dev (since then left) and that he was unable to adjust the tool as of the time I was discussing with him. A warning to not expect too big of a copy of the Calgary network. This concludes my thoughts for now, But I hope to return with some more finds I have on more areas of rail interest after I rest up. The amount of dirt appears realistic to me, trackage in North America tends to be maintained a lot less regularly than is the case in Europe, and you'll often see a significant amount of debris and vegetation buildup, with some places appearing almost derelict. Given the vast distances out here involved it's just not plausible to maintain the lines to the same standard. Even the given image shows a significant bit more ballast as the image I presented. By my eye that's not dirt at all but overgrown ballast. However this does supports my point about the use of wooden sleepers. 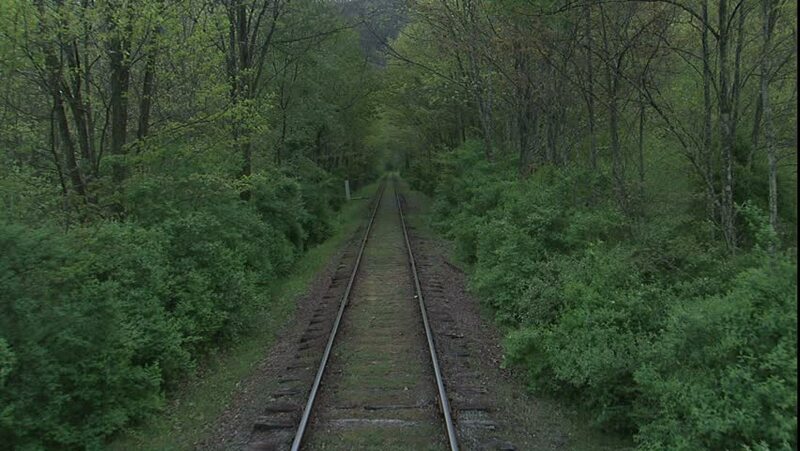 I am hard pressed to actually find any examples of none abandoned lines that look like that, a causal search still shows decently maintained lines (not euro standard (like with a protective fence) but decent) this may well be because its easier to take pictures away from forested areas like above. I've seen long stretches of active track that were considerably more neglected, sometimes to the point where it was difficult to even make out the rails when riding in the locomotive. And yes, most of the really neglected track is located in less accessible places where they are less likely to be photographed.